A simple upgrade could improve productivity and make you more money. The two most common mobile compressors are rotary screw air compressors and reciprocating (or piston) air compressors. Traditionally, the piston compressor has been the more widely used due to price and availability. Many commercial van operators request reciprocating (“recip(s)”) compressors because they simply do not understand the difference between a rotary screw and a recip and are only familiar with what they’ve traditionally used. Work faster. Generally rotary screw air compressors deliver more air compared to reciprocating compressors of the same size. Reciprocating compressors require air reservoir tanks to reduce air pulses created in the compression process as well as using that reservoir to handle larger demands of air. Rotary screw compressors do not create the same type of air pulses and can deliver large amounts of air when required without the need of a reservoir tank. Not waiting for your compressor to keep up to your work means you can get jobs done faster and complete more jobs in a day. Work longer. Rotary screw air compressors can operate at 100% duty cycle. Duty cycle is the amount of time a compressor can continuously operate without stopping to prevent overheating in a given time. For example, if a compressor can run for 60 minutes in a 60-minute period without stopping, it is 100% duty cycle. If it can only run for 30 out of 60 minutes, it is 50% duty cycle. Most reciprocating compressors are only capable of 50% duty cycle. This means those compressors can only operate half the time which reduces your ability to get the job done. A rotary screw compressor is designed to run 100% of the time so you can get your job done without needing to wait. Work worry-free. Rotary screw air compressors last longer than reciprocating air compressors. Like an engine, reciprocating compressors have piston rings and other components that contact each other and wear over time. With that wear comes a decrease in performance, oil carry over and more heat generation. A rotary screw compressor is designed so that the compressor oil seals the internal rotors, preventing parts from wearing out. Unlike a reciprocating compressor that loses performance with age, the rotary screw compressor maintains the same performance throughout its long life. Work with more. Rotary screw air compressors are lighter weight and provide more capacity in a smaller package than reciprocating air compressors. This means vehicles can haul more equipment, tools and materials, can spend less time driving between shops and jobsites, and can get jobs done faster. Not only can you haul more you can do more. The rotary screw compressor will provide enough power to operate most common hand-held pneumatic tools. From impact wrenches and deburring tools to grinders, you’ll get the air to power these tools when you need it. Rotary screw compressors provide many advantages over their reciprocating compressor counterparts. Size, air delivery, duty cycle and longevity are all factors that firmly land in favor of a rotary screw compressor. Learn more in our Guide to Rotary Screw Air Compressors. 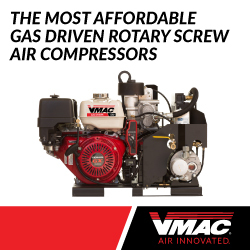 For your van, VMAC offers the UNDERHOOD 30 CFM rotary screw compressor system that brings you all of these benefits. It also addresses the safety issues created by installing an air compressor in the cargo area of a van.